Seasoned veterans Old Madrid, used Xavier John’s first half hat trick, to welcome new comers F.C. 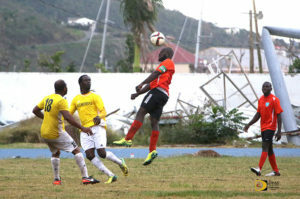 Sea Argo to the BVI Football Association League on Sunday afternoon on the rain soaked A. O. Shirley Grounds. John’s legs fired Old Madrid to a 7-2 victory over F.C. Sea Argo. After Rohan Sweeney blasted a shot past goalie William Prince in the 12th minute, John beat the defense off a feed from a winger, making it 3-0 in the 24th minute. He completed his hat trick in the 27th off a straight shot from 15 yards out. With no bench and a player-coach, John didn’t give the F.C. Sea Argo players an opportunity to get settled on the pitch when he scored the match’s first goal a minute into play. F.C. Sea Argo’s Trevor D’Aguair padded Old Madrid’s score to 5-0 when he scored an own goal in the 39th minute, before teammate Reuben Stoby connected in the 43rd, cutting the deficit to 5-1 at the half. Frederick Salmon scored over the wall off a penalty in the 72nd and F.C. Sea Argo’s player-coach Gain Foster scored in the 78th minute of play, making it 6-2, before Bernard Grant scored the game’s final goal in the 82nd. Foster said they need to acquire more players as they have no bench. He’s trying to lead by example he said, noting that they were 5-0 at halftime but show a bit of what they can do in the second half. “Hopefully, through our training, we can improve in the areas where we’re lacking,” he said. Old Madrid’s coach Elroy “Mandraker” Mills, said his team played well in the first half and then began working against the game plan. Mills said they’re eyeing the league’s top prize this season. At the Valley Recreation Grounds on Virgin Gorda, the Sugar Boys improved to 2-0, by routing the Wolues 6-0, on captain Derol Redhead’s second half hat trick. They carried Michael Castello’s goal in the 26th minute into halftime before Redhead took over the scoring binge. He had goals in the 47th, 69th and 87th sandwiched between Mervin Dainty’s score in the 82nd. Romaine Henry added the sixth goal in the 91st minute. The early game saw Virgin Gorda United and the Panthers settling for a 1-1 draw, after playing to a 0-0 half. Lance Renolds put the home side on the board in the 49th minute and when it seemed that victory was secured, Kevonne Bibby netted in the 91st for the Panthers, for a share of the points. At 4:30 p.m. on Sunday, the Panthers will face One Love at the A. O. Shirley Grounds on Tortola while Virgin Gorda United will host F.C. Sea Argo at the Valley Recreation Grounds at 5 p.m.